You need this Dental Care Kit! Taking good care of your teeth and mouth is essential and so important! because your oral health can directly affect your overall health and life quality. Yet, brushing your teeth regularly is often not enough to maintain optimal oral health, as toothbrushes focus on the surface of teeth, struggling to reach spaces between them and around your gums, and even the regular flossing can't do the job well. That's where the Dental Care kit for deeper teeth cleaning come in. With this inexpensive Dental Care Kit, you can get to even the hardest to reach areas of the mouth to perform a dentist-level deep cleaning, removing dental calculi, dental plaque, back yellow pigment, tartar, food debris. What is more, the regular use of the dental tool set will help boost your immune system, keeping you staying away from stomatitis, caries, and gingivitis. What is the kit consist of? Want to get rid of tooth staining, cavities, gum disease and other oral health problems? Want to have healthier gum, brighter teeth, fresher breath and strengthen your healthy smile?Time to step up you dental routine with our Dental Care Kit for unbeatable DIY deep cleaning! If any any reason you wish to return kit, we will walk you through hassle-free 100% refund without any question. You really have nothing to loose. Order Now! Click the yellow "Add To Cart" button to place your order. THE DENTAL CARE KIT YOU NEED: When stubborn plaque,tartar and stains from your teeth can't be removed by toothbrush, dental tape or dental floss, this Dental Care Kit is the kit you need to help you out effectively. You can use the Dental Tools provided in the Dental Care Kit to remove the tough stains, plague, tartar, bacteria and debris from your teeth and gum. The whitening teeth and fresher breath you are gonna have will get back your sparkling smile! GIFT TO SHARE: This would be a lovely gift for your friends, family and loved ones. Health is above Wealth! Imagine how much they will love it as it will help them keep their teeth and gums healthy, saying goodbye to bad breath, gum disease or tooth decay. The Dental Tools are also awesome to keep the gums and teeth cleaning of our lovely pets easy, get one dental care set for them and use it weekly on your dog or cat's teeth cleaning as part of their oral hygiene care. CONVENIENT AND FASHION CASE: It comes with a finely-made durable zippered case to keep your dental tools organized well,clean and secure all the time. The fashion design and texture, it is your perfect pal ! 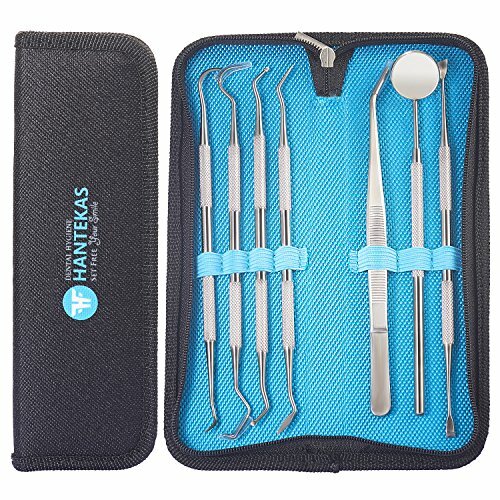 ENJOY THE HEALTHY EXPERIENCE: What a wonderful experience when you can enjoy the same good feeling as after a dental appointment with this inexpensive but high quality dentist prepared tools kit! This dentist approved tools kit you really deserve to have, PLUS, you will enjoy our unique 18 months(One and half years ) warranty, so, take it home now and enjoy it! If you have any questions about this product by HANTEKAS, contact us by completing and submitting the form below. If you are looking for a specif part number, please include it with your message.